Sterling silver has been prized for centuries. It is an alloy of silver, and must comprise 92.5% silver and 7.5% other metals in order to be designated as sterling. It is a standard that has existed since Edward I decreed it in 1300! With such an exacting standard as to what comprises sterling silver, it’s no wonder that a sterling silver watch is highly regarded and much sought after. Unlike silver plating, sterling silver is not easily tarnished or scraped off. It is also non-magnetic - all good reasons why watchmakers love working with sterling silver. Watches made with sterling silver are consummately elegant, which is why they have been used to such great effect in pocket watches. 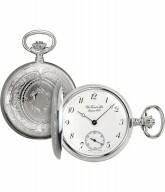 Anytime Watches has sterling silver pocket watches on offer. 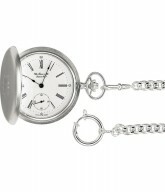 A sterling silver watch is elegance and class personified.